We appreciate awesome testimonials like this. This drives us to continue to do excellent work in the future. “I’m a busy guy. When it comes down to it, I have to battle for my free time like a prizefighter. To me, it’s a real drag when I have to spend my valuable minutes and hours running any type of errands. That’s the beauty of this company I just gave my business to. It’s called Mobile Wash and it’s awesome. Take a moment and imagine a full service car wash coming to you wherever you are. Actually, you technically don’t even have to be there. You can be off location as long as you leave these folks access to your car. This company brings the car wash to you. 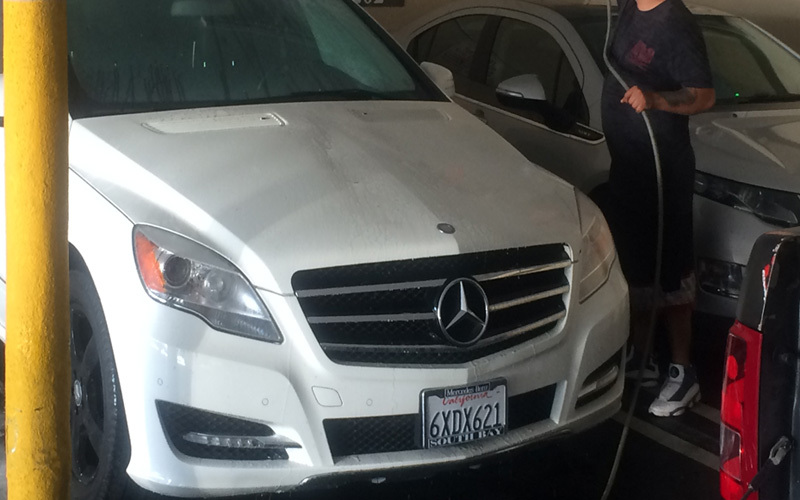 Mobile Wash has their own water tank, sprayers, sponges, polishing rags and detailing tools. Two representatives show up and give you the VIP treatment. They went to work on my car and basically gave it a baptism. I’ll be honest, I haven’t had the luxury of free time in a while, since I work two jobs and go to night school, so my car was looking pretty haggard. I’ll take a wild guess and say that it had something like five different types of bird excrement on it, not to mention an unhealthy amount of dirt buildup. I’m a child of divorce, give me a break. Anyway, these guys made my ride shine again. At first I was a little hesitant. I mean, I try to be an environmentally conscious guy. I know what you’re thinking, “oh, am I reading the thoughts and sentiment of a tree-hugging millennial right now?” It’s not like that. I just try to think about the world outside of myself as much as I can. I also live in California in the middle of an intense drought. That seems to be the same page that Mobile Wash is on. They stay conservative with their water usage. They use eco-friendly products, so that’s pretty cool. What’s even better is that these guys showed up to my work and gave me a professional-grade car wash in the parking lot. I didn’t even have to use up my lunch break! I was getting work done in the office while they took care of my car. I watched from the window here and there, just to make sure they weren’t short changing me. Mobile Wash is legit. They pulled my seats forward and vacuumed the nether regions of my car, got down to the nitty gritty. They washed, shined and polished from top to bottom, even treating my rims and tires.